Despite all the great pizza places the borough has to offer, when you tell someone you are going for pie in Brooklyn, they assume you are going to Grimaldi’s. The Snob was long overdue for his maiden visit to the place. Just before Thanksgiving, I was back in town and sought to rectify this situation. I had failed in an earlier attempt last year when I met up with an over two-hour wait. This time, with Mrs. Pie and my brother in tow, we hoped there would be a shorter line for a late Friday afternoon lunch. 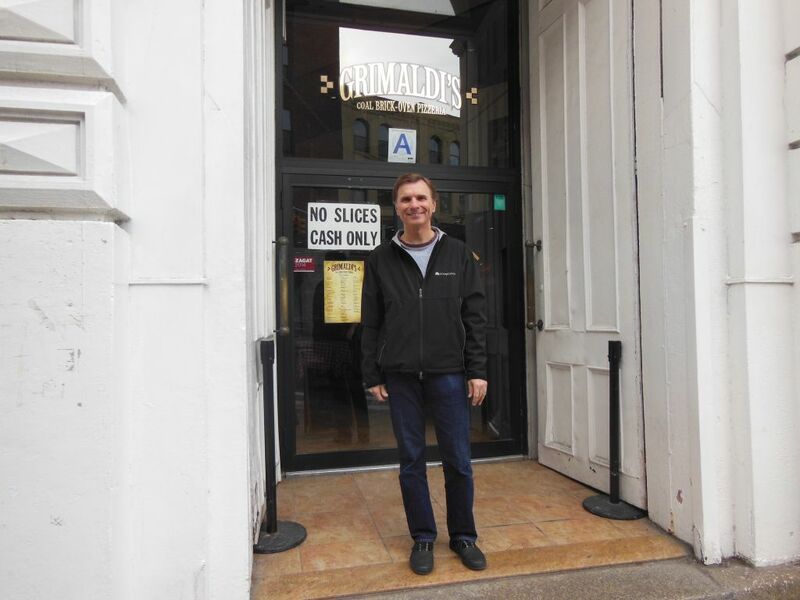 Grimaldi’s long involved history has been well documented. 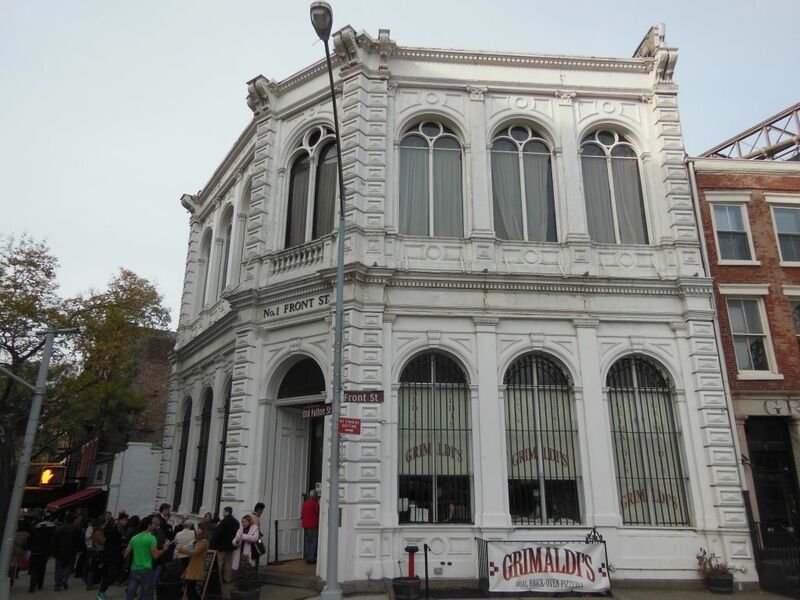 The latest event on their timeline was in December 2011 when they moved their legendary coal brick oven down the corner from its original location into a larger historic bank building that was constructed in 1869. 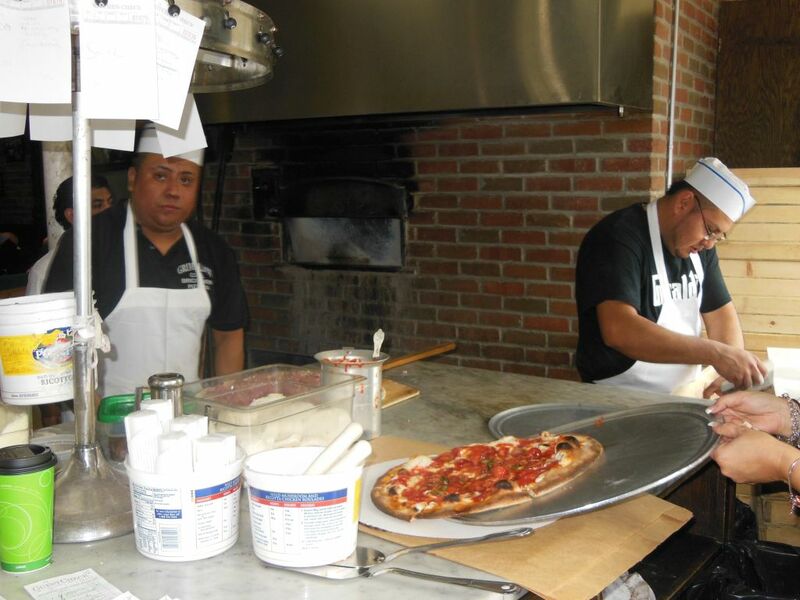 Just last year, their original owner, Patsy Grimaldi, re-entered the business with his new Juliana’s just a few doors down in the original Grimaldi’s location. This latest event now creates an awesome pizza triangle under the Brooklyn Bridge with these two places joined by the lesser-known, Snob-approved Ignazio’s. Our wait outside was only 15 minutes, and excitedly we were seated in the downstairs dining room opposite their rather non-descript coal oven. There is an upstairs dining area, and overall both rooms seemed rather small given the outside appearance of the building. The first floor featured the bar which today was dry due to a liquor license renewal issue. Not having done much homework on Grimaldi’s, I was surprised to discover that despite the look and feel of a restaurant, it was a pizza-only place. In addition to a single antipasto item and calzones, your choice was limited to pizza: large or small, regular or white, plus your toppings. No salads to Mrs. Pie’s chagrin. Like many other New York establishments, it is no slices and cash only. Our team of three ordered two large pies: one plain and one with half–peps for my sibling. The going rate these days was a reasonable $14 for the large which turned out to be an eight-slicer. While waiting in anticipation, I pondered the Grimaldi’s experience. From the attention we received on line from some local film-maker to the preponderance of out-of-towners taking photos out front, were we simply lured into a one-time famous institution that after changing hands had turned into a tourist trap? Add to this that there are now several other Grimaldi’s scattered around the country. Only the pies about to come out of the oven would tell! The wait for the pies inside turned out to be shorter than the one we had outside. Since we were eating coal oven pizza in Brooklyn, the finished product was served up Margherita style. Although not my favorite in the classic sense, this is something the Snob can really enjoy when it is of exceptional quality. And, folks, Grimaldi’s passed the test in a big way producing a pizza nothing other than outstandingly delicious. What makes this pie so delightful is its “chewy-licious” crust. There is just something about that toasted coal-fired taste that is hard to describe. On top, the perfectly-blended combination of oil, cheese, sauce and basil was equally yummy in its own right. I just can’t believe that something could taste this good. One tip is to eat it quick since it seemed to get cold fast. This pie tastes best when it’s hot and fresh. 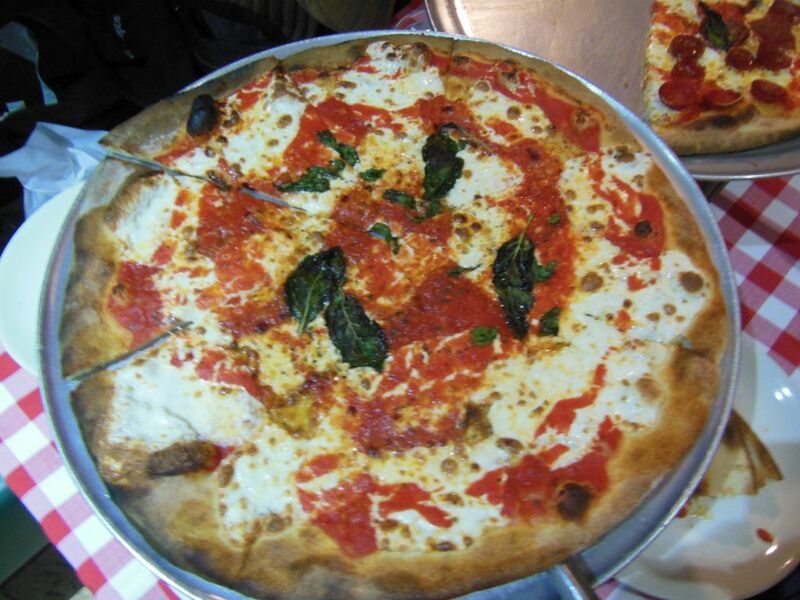 While perhaps not as gourmet exquisite as the Margherita pie over at Di Fara, Grimaldi’s makes as perfect a classic Brooklyn coal oven pizza as can be. 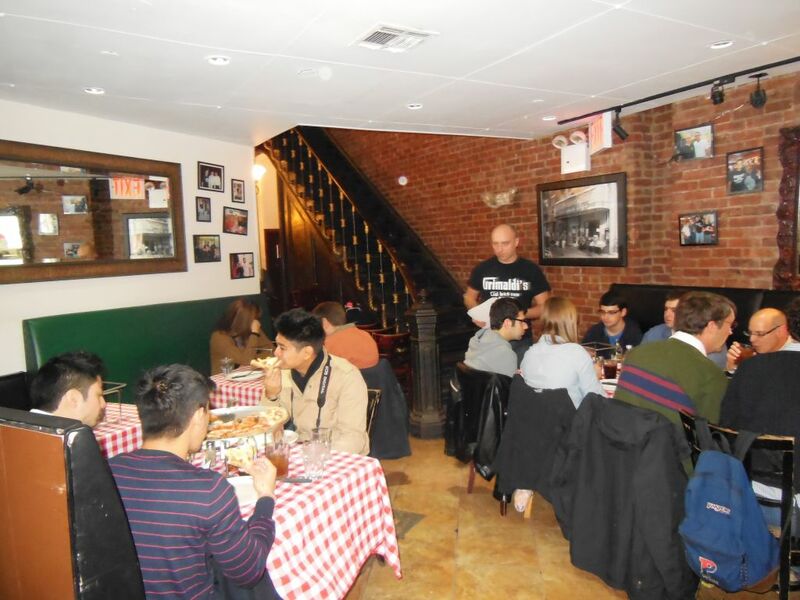 The Snob is glad he made this trip and thinks that a visit to Grimaldi’s should be on every serious pizza-lovers list. Perhaps the lines won’t be as along now that there are three great choices on the Brooklyn Pizza Triangle.